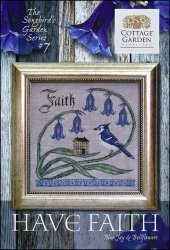 Songbird Garden Series 7: Have Faith [H1931] - $9.00 : Yarn Tree, Your wholesale source for cross stitch supplies. Cross stitch pattern from Cottage Garden Samplings. Among the beautiful bellflowers sits a blue jay looking off into the distance. A two-story house sits on one of the leaves of the bellflowers. "Have Faith" in what will be. Stitch count is 159W x 159H.